The United States Congress designated the Pusch Ridge Wilderness (map) in 1978 and it now has a total of 56,974 acres. All of this wilderness is located in Arizona and is managed by the Forest Service. Pusch Ridge rises from the desert floor to over 9,000 feet above sea level, affording a clear view over the sprawling metropolis of Tucson. More and more people are climbing Pusch Ridge to take in that view and revel in the cool shade of pine, fir, aspen, and maple. No Wilderness in Coronado National Forest is more heavily visited than Pusch Ridge, and wildlife species there are increasingly disturbed and threatened. It is no secret what attracts people to the region. Here in the essentially dry Santa Catalina Mountains, several streams originate in the high country. Summer temperatures may be 30 degrees cooler than in the nearby city. An extensive trail system provides access to Pusch Ridge. Trailheads near Tucson are easy to reach, as are those at higher elevations along General Hitchcock Highway, which ascends Mount Lemmon. Hikers crossing this extremely steep terrain find themselves among rocky bluffs and towering peaks where solitude can still be found for those who are willing to hike a few miles. Due to the 2003 Aspen Fire, trails may be blocked by fallen trees and visitors are advised to use caution. The fire has made travel in the wilderness more difficult and dangerous. For specific information regarding trail conditions contact the local Forest Service Office. 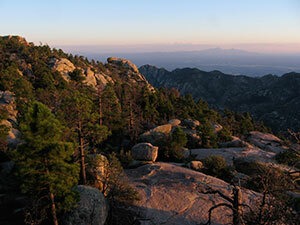 Planning to Visit the Pusch Ridge Wilderness? How to follow the seven standard Leave No Trace principles differs in different parts of the country (desert vs. Rocky Mountains). Click on any of the principles listed below to learn more about how they apply in the Pusch Ridge Wilderness.